Nick Smoot and Ryan Arnold wanted to create a hub for robotics startup companies in Coeur d’Alene. This would be done through a collaboration of entrepreneurs, businesses and community leaders to create Innovation Collective. What transpired was beyond their wildest dreams. A robot from the University of Idaho on display. On Aug. 15 the first Think Big Festival brought 250 attendees to North Idaho College to hear from experts in the field of robotics. Smoot and Arnold were able to bring in Yoshikazu Kanamiya, a 35-year robotics professor from Japan. Kanamiya has worked extensively on medical robotics to help the elderly. Smoot said he wanted to bring Kanamiya back again during his upcoming sabbatical to advance medical rehab and robotics. Representatives from Kootenai Health, University of Idaho and Jobs Plus have also joined with Innovation Collective to work together and move medical robotics forward. Other speakers included Brad Templeton, who worked on the creation of Google cars. Templeton spoke about the robotic car industry. Brent Regan, a local entrepreneur, discussed telepresence and robotics. Artist and architect, Guvenc Ozel, spoke about intelligent buildings equipped with artificial intelligence and Kathryn Myronuk, co-founder of Singularity University, discussed expediential technology where computers will surpass human intelligence. The conference brought together a variety of people. Kelly Clark with Exploring Families came from Spokane. “I wanted to investigate an educational activity for kids with the robots. Our organization is all about education with a focus on S.T.E.M. (Science, Technology, Engineering, and Math),” Clark said. Joshua Johnson, a local inventor and fabricator, came to collaborate with others. Johnson owns Objects Unlimited, using CNC technologies, 3-D Printing, and a variety of materials. At the conclusion of the event, Smoot advised participants to visit http://www.innovatecda.com/ to check out the more than 50 events that have been scheduled throughout the year. No doubt about it, robots are in Coeur d’Alene’s future. 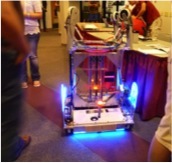 This entry was posted in Employers and tagged idaho department of labor, robotics, Think Big Festival on September 2, 2014 by Idaho Department of Labor.